I started with some 5.5" MDF and then sent it through the table saw with the blade at 45 degrees so the two corners would meet at a corner. Then I used my compressor and nail gun to nail the MDF to the wall and added some narrow corner moulding on all three sides. I also put some 1/4" wood on the top as sort of a topper. The corner moulding is 3/4" wide, so I measured where the baseboard and crown would be and then added 3/4". I cut some 1/4" pieces of plywood to put at the top and bottom with that measurement so there would be 3/4" all the way around once the baseboard and crown were on. I measured the baseboard and drew on the baseboard where I needed to trim with the multi-tool and chisel. 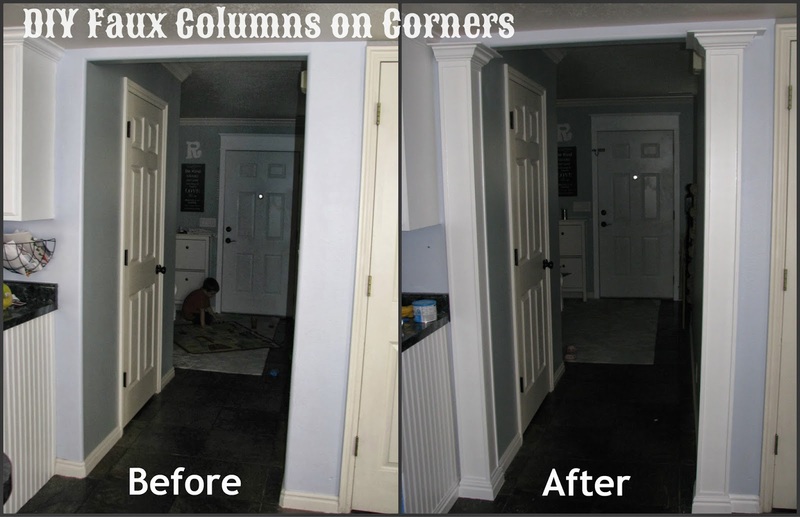 I cut and put the crown in place, filled with filler, sanded, and caulked all around the whole column. After I taped it off, it took two coats of primer and two coats of semi-gloss bright white paint (sanding in between coats).